Listen to Bill Berkson read “The One God” from his new collection “Expect Delays.” More from Berkson and his conversation with Art Beat in January. And a path to the beach. Cuddle two abreast on a tray. Pressing along the keen incline. Flutter in turn as nights subside? 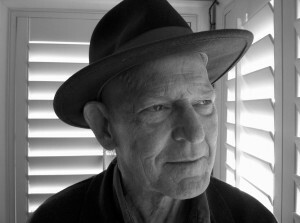 A poet, critic and teacher, Bill Berkson has written some twenty poetry collections and has been active in the art and literary worlds since his early twenties. His books of poetry include “Gloria,” a portfolio of poems with etchings by Alex Katz, “Our Friends Will Pass Among You Silently” and “Portrait and Dream,” which won the Balcones Prize for Best Book of Poetry in 2010. “Expect Delays” is his most recent book. He is a recipient of fellowships from the National Endowment for the Arts, Yaddo, the Briarcombe Foundation, the Fund for Poetry and the Poets Foundation. He is professor emeritus at the San Francisco Art Institute, where, between 1984 and 2008, he taught art history, art writing and poetry and he divides his time between San Francisco and Manhattan. “The One God” from “Expect Delays” by Bill Berkson, courtesy of Coffee House Press.